Can track the location and contents of each container in real-time. Makes it easy to find and withdraw inventory for production or pick, pack, and ship products for customers. Works at multiple geographic locations, in production areas, in multiple warehouses, and on-site, in the field. Uniformly tracks raw, intermediate, and finished goods materials, as well as assets and work-in-process materials. Avoids changing barcode labels whenever contents of a container are changed. Enables permanent tracking barcodes to be attached to bins, totes, and trolleys used to hold materials but still supports the use of temporary barcodes on containers that can be discarded. Can perform tracking with easy-to-use pre-printed rolls of license-plate tracking barcodes without needing the use barcode label printers. 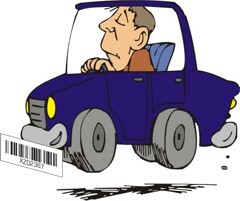 But enables use of barcode printers, when needed, for special labels with human readable information. Can use container data to quickly find materials for picking and then prevent picking errors. Can track materials in nested containers and use this data to generate ASNs for supply chain integration. Enables tracking the quality control status of the material in each container and preventing use or shipment of defective materials. Enables capturing materials traceability history as to which materials went into which product.